Get the Full StoryCheck out the results of the four FS1 preliminary card bouts at UFC 226: Miocic vs. Cormier in Las Vegas, Nevada. The UFC 226 preliminary card is all finished, and on the FS1 portion of the broadcast, Curtis Millender improved to 2-0 inside the Octagon with a decision win over Max Griffin. Drakkar Klose turned in a very good performance in beating the always entertaining Lando Vannata. 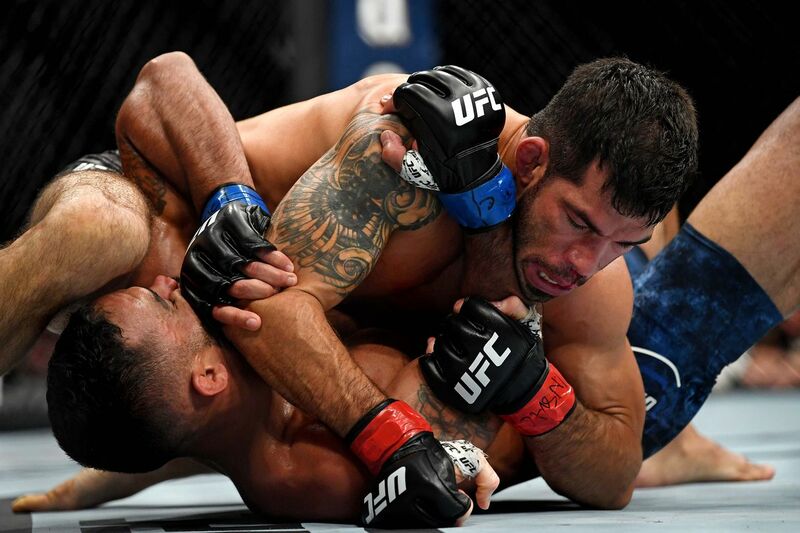 Raphael Assuncao made it a really impressive 11-1 at bantamweight with a shutout victory vs. Rob Font, and Paulo Costa remained unbeaten in a thriller with Uriah Hall. Here s how the fights played out. Hall started off brightly with multiple stinging jabs to back the Brazilian up. Costa answered with kicks to the body and a thudding right hand as Hall was backing up. A groin strike by Costa momentarily halted action, as Hall took time to recover from the kick. Upon restart, Hall got a spinning kick to the body on Costa and Costa took it without issue. Hall kept jabbing Costa up, but Costa came forward and attacked the body and head with monstrous power punches, kicks, and knees. Hall absorbed them all, and he also absorbed several low blow punches by the Brazilian, and the referee inexplicably didn t dock a point despite warning Costa repeatedly both for that and for extending fingers towards Hall s eyes. Costa sought to close the distance and land those haymakers shots on Hall, and he even used his own jab to bother the TUF 17 runner-up. Hall went for a takedown, only for Costa to spring back up. A slugfest ensued and with Costa sensing Hall was in trouble, he got caught with a counter shot and was rocked. Hall did not take advantage of the oportunity, perhaps a sign that he was still rocked. Costa recovered and unleashed the fury on Uriah, blasting him with body and head shots, stiffening Hall with a left hook, then dropping him with a three-punch combo to get the TKO finish. There wasn t much to separate these two in the opening round, until Assuncao cracked Font with a right hand that briefly put him down. A beautiful shot by the Brazilian to leave no doubt as to which fighter took round 1. Assuncao took Font down straight away in round 2 and and unleashed ground-and-pound from side control. Font scrambled out of a bad spot but Assuncao quickly got back to side mount and dropped a big elbow on Rob s face. Midway through the contest, Font got back to his feet, but in need of something major to turn the fight around. Assuncao was able to pick off Font with effective counterpunching and he seldom got caught flush in return. Round 3 was more of the same in the stand-up, as Assuncao landed sharp counter lefts and Font only had success in spurts. A leg kick put Font down as he lost his balance, then he sprung back up. Font managed to connect on a right hand, but still needed to do a lot more in order to win. In the closing minutes, Assuncao ducked under and completed a double leg takedown, and controlled Font from dominant positions to ride out another convincing win. lose immediately pressured Vannata towards the fence, and landed a couple of hard knees. Vannata took Klose for a ride but couldn t hold him down, and then Klose was unable to get Vannata to the mat even after lifting him in the air. After Vannata connected on a few quality shots, a leg kick by Klose had Vannata noticeably grimace. Klose was relentless with his forward movement and want of a clinch against the fence. Vannata misfired on a spinning elbow and ate an elbow in the clinch for his troubles, as Klose limited how much time Vannata had to work with from range. Vannata upped his tempo in round 2, engaging in a firefight with Klose and landing some quality strikes. A nasty elbow cut Vannata s face open, and Klose was steadily taking control of proceedings. The calf kicks bothered Vannata significantly and affected his balance. Groovy Lando fought with a sense of urgency in the final round, looking for a fight-finishing strike, but Klose s constant pressure, leg kicks, and well-timed strikes coming in continued to pose major problems. Klose clinched up against the fence, failing to get the takedown, but killing off valuable time. Vannata scored a takedown and took the back with a minute remaining, but he was too high on the hips and stood back up. Klose ended things with a takedown of his own, as he got back in the win column. Millender looked to time Griffin coming in with jumping knees in the early stages. He led the striking exchanges and kept Griffin at bay until Pain shot for a takedown and got it. Griffin went to work from half-guard, and while he didn t get a whole lot done offensively, the short elbows and punches were enough to swing round 1 in his favor. Round 2 began with Millender coming out strongly and again throwing kicks and knees at his opponent. A straight right backed Millender up, causing a clinch, which saw Griffin land a short inside elbow. Millender landed the more powerful shots for most of the round, and this time kept Griffin from taking him down. Hard knees to the body and a left hand had Griffin retreating and hurt, and Millender capped off the round with hammerfists after a takedown. Griffin unleashed big punches to start round 3, hoping to pressure Millender and make him fight off the backfoot. Millender responded with the brutal counter knees to the body, then Griffin went for a pivotal takedown and was unable to get it. The rest of the fight was all Curtious Curtis, as he tagged and rocked Griffin multiple times to seal the round and thus the fight.